This archive holds all posts form August 7, 2009. Panelists: Judy Wajcman, Saskia Sassen, Elizabeth Friedman, Wendy Christiansen, Discussant: France Winddance Twine, Organizer: Jessie Daniels. And, more informally, I’ll be hanging out at the book exhibit a lot and plan to crash this blogger party on Sunday evening. So, if you spot me (or my name badge! ), say hello. You can also @ me via Twitter (@JessieNYC). In the meantime, Joe will be holding down the blogging here and taking a break from the meetings to celebrate his 50th wedding anniversary ~ congratulations! Right now, we live in a nation where children of color experience significant health disparities that begin before birth and follow them throughout their lives. Black infants are more than twice as likely as white infants to die before their first birthday and have higher infant mortality rates than children in 62 nations including Barbados, Malaysia and Thailand. One in every seven babies born to black mothers is born at low birthweight, a core risk factor for infant mortality and childhood developmental disorders. The rate of black infants born at low birthweight in the United States is worse than the rate of low birthweight in more than 100 nations including Algeria, Botswana and Panama. Not surprisingly, black and Latino children also have higher incidences of childhood illnesses than white children. For example, one out of eight black children has asthma — one of the most common illnesses in children — compared to one in 12 white children. One out of every four black two-year-olds and one out of every five Latino two-year-olds is not fully immunized, although we know that every dollar spent vaccinating children against measles, mumps and rubella saves $16 in future costs. More than 30 percent of black children and about 40 percent of Latino children report not receiving dental care. Minority children are more likely to be living in poverty. However, racial disparities aren’t just about socio-economic status, although more than three-quarters of uninsured black children have a working parent, and more than half have a parent who works full-time throughout the year. Edelman, a long-time defender of children’s rights, emphasizes “It doesn’t have to be this way,” and urges for reform on health care which would help address these persistent inequalities. Yet, even as much of the national public debate right now is focused on “health care reform” and that discussion has been derailed by racism. 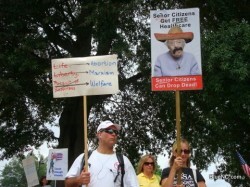 Some anti-health care protesters, like the one in this photo (from here), cast their objections to health care reform in rather explicitly racist terms. As Maggie Mahar writes, the health care reform effort has reignited what she refers to as the “Culture Wars,” a familiar story in the American political landscape. When viewed in terms of Edelman’s point about the impact of racial inequality on children’s health, these kinds of battle lines seem even more cruel. I want to suggest that we re-frame the current health care reform debate in terms of social justice. In my view, supporting universal health care for everyone in the U.S. is an important step toward re-dressing the persistent racial inequality that is endemic in our society.